The sun sustains life, but it also can harm our eyes. Unsafe sun exposure causes or may contribute to several eye conditions and diseases. It can also cause eye injuries. Earth’s ozone layer absorbs most of the ultraviolet (UV) light from the sun, but chemicals have damaged it. Therefore, we must take extra precautions to prevent cataracts, age-related macular degeneration, ocular melanoma (eye cancer), and eye injuries such as pterygium (Surfer’s Eye), photokeratitis (snow blindness), and flash blindness. The sun is also a driving hazard when low on the horizon. The body contains its own “sunscreen,” which is melanin. Dark-skinned people have more melanin and therefore, more built-in sun protection. The eye also contains melanin, but the amount reduces with age. Also, people with darker irises have more built-in solar protection than people with lighter eyes – blue, green, hazel and, in many cases of albinism, pink. UV rays cause oxidation. For some, over time, retinal cells may be gradually destroyed by ongoing exposure to the sun’s rays. In seniors, the antioxidant defense system becomes less efficient. Lower antioxidants in the eyes are believed to be an important contributing factor to eye diseases later in life. Some exposure to sunlight is necessary for good health. Exposure to sunlight improves mood.1 It regulates sleep and wake cycles. The body manufactures vitamin D in response to sunlight. Vitamin D deficiency has become widespread2 as electronics and workplaces have kept more people indoors. Large amounts of vitamin D are produced when exposing bare skin to sunlight for half the amount of time it takes to turn the skin pink. This might mean 15 minutes for a very light-skinned person, or several hours for a dark-skinned person. Vitamin D cannot be obtained in sufficient quantities through diet, but a supplement can compensate in cases of deficiency or lack of access to sufficient amounts of sunlight. Children who spend most of their time indoors are more likely to develop the eye condition myopia – nearsightedness – and require corrective lenses. There are two theories: too much close-up work, or too little dopamine, an important brain chemical. Spending time in sunlight causes the brain to produce more dopamine. This is especially a problem in parts of Asia, where schoolchildren spend long days studying. However, too much of a good thing can hurt you. Excessive sun exposure can cause a variety of unwanted eye diseases and conditions. Description: A cataract clouds the eye’s lens. Cataracts are the major cause of vision loss in the United States. This disease strikes mostly people over age 40, affecting approximately 22% of Caucasians by their 60’s, and 70% by age 80.3 The clouding gets worse over time. Symptoms are blurring, haze, less color perception, impaired night vision, halos, and difficulty with depth perception (increasing the chances of falling). Causes may include UV light exposure, genetic causes, past eye surgery, diabetes, hypertension, obesity, smoking, poor diet (lack of antioxidants), poor absorption, medications (corticosteroids, statins, hormone replacement therapy), high alcohol consumption, family history and high myopia.4 Cataracts are typically treated by replacing the lens with an artificial lens under local anesthetic in an outpatient facility. Cataract patients who wish to delay or avoid surgery sometimes try homeopathic eye drops such as cineraria. This can be effective, particularly in the early stages of cataracts. Solar Safety: Exposure to UV light is a known cause of cataracts that you can control. Wear quality sunglasses that block 99-100% of UV rays or say “UV absorption up to 400nm.” If you wear prescription glasses, get transitional lenses, prescription sunglasses or larger “goggle-style” glasses that go over your prescription glasses. Contact lens wearers need sunglasses. Wear a wide-brimmed hat outdoors. If you have had cataract surgery, the doctor may have used a UV-absorbent lens, but wear sunglasses anyway for thorough protection. 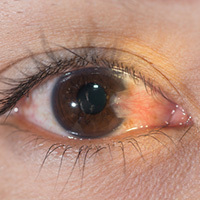 Description: Pterygium is a growth of pink, fleshy tissue that appears on the white of the eye. It typically starts close to the nose and grows toward the eye’s center. This slow-growing triangular-shaped tissue may eventually cover the pupil. It is called Surfer’s Eye because spending a lot of time outdoors is the major risk factor. Sunlight is the most likely culprit, but wind and sand may also be factors. In the US, the overall rate is 2%, and 4% in California and Florida. Most of the time, it does not need treatment, but it can be irritating and eventually affect vision. In some cases, surgery may be warranted; however, it tends to grow back quickly. Eye drops can help alleviate associated irritation. Learn more about Pteryguim. Solar Safety: Wear wrap-around sunglasses or tinted goggles to help prevent sun, wind and grit from causing an eye injury. Description: The Inuit were well aware that exposure to sunlight reflecting off snow could cause eye injuries. They fashioned caribou antlers into snow goggles. Photokeratitis is like a sunburn on the eye. Ultraviolet rays damage the cornea and the conjunctiva. Boaters and beach lovers should also be alert, because the sun’s rays reflect off water and sand too. Tanning lamps and tanning beds, and welding arcs can also cause photokeratitis. The eyes become painful, red, irritated, watery, sensitive to bright light, blurry, swollen, and/or have a gritty feeling. The victim may also have headaches, see halos, have eyelid twitching, have small pupils and sometimes temporary vision loss. If symptoms appear, get out of the light, remove contact lenses and rest. Place a cold washcloth over the eyes and take pain relievers. Use artificial tears. Do not rub. The eyes will usually heal on their own in a day or two, but an ophthalmologist can be consulted. Solar Safety: Tinted ski goggles or sunglasses protect the eyes in cold climates. Boaters and beach visitors should wear sunglasses and a wide-brimmed hat. Always use eye protection when welding or tanning to prevent eye injuries. Description: Some researchers have linked sun exposure – even at younger ages – with a higher risk of Age-Related Macular Degeneration (ARMD). A large study5 found that teens and adults who spent five or more hours per day outdoors before age 40 had double the risk of getting early-onset ARDM. Solar Safety: Protect the eyes and skin by wearing a hat, sunglasses and sunscreen when outdoors. Sunlight is contraindicated for ARMD patients who recently had photodynamic therapy to treat their condition. Solar Safety: Melanoma risk increases with sun exposure. Protect the eyes and skin from excessive sun exposure. Wearing sunglasses and a hat when outdoors in sunlight helps protect the eyes and the skin on the head and face. Sunscreen should never be put on the eyes or eyelids, but should be applied liberally to the face and ears every 2 hours when outdoors. Use waterproof sunscreen that won’t run into the eyes. Avoid tanning beds or wear tanning goggles every time. Description: The retina can be damaged or even destroyed by very bright light. During solar eclipses, children are especially vulnerable due to their impulsiveness and very clear lenses. Looking directly at the sun for a period of time can also cause eye injuries, especially when magnified with a telescope or binoculars. Solar Safety: Children and adults should watch solar eclipses on television. Planetariums and science centers can safely project an eclipse. Avoid looking directly at the sun with the naked eye or through binoculars. Description: When the sun is at a low angle, a driver can be suddenly blinded when the vehicle turns toward the sun.7 This problem is amplified if the windshield is dirty. Solar Safety: Use the sun visor. Reduce glare by wearing polarized sunglasses. Reduce speed and turn the headlights on so other drivers can see you. Keep the windshield clean on both sides. Protecting your eyes from sunlight is your primary defense against a long list of problems. Keep protective sunglasses in your vehicle, in your bag, and near the door. Wear sunglasses and a hat, and use sunscreen regularly. Damage from UV light is cumulative. 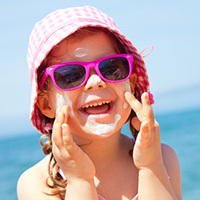 Make sure children and teens take sun protection seriously, and require them to follow solar safety instructions. Two great carotenoid antioxidants that help protect against sun damage are lutein and zeaxanthin. They are both found in the retina and lenses of the eyes. By filtering UV and blue light, which is destructive to retinal cells, zeaxanthin and lutein act as a sort of built-in sunscreen. They also act as powerful antioxidants helping to neutralize the damaging effects of free radicals and oxidative stress. Lutein is abundant in leafy green vegetables and yellow vegetables such as corn. Lutein supplements can be made from bright yellow marigold flowers. Zeaxanthin is found in orange food such as saffron and oranges, and in green vegetables like peas, broccoli, spinach and kale. If sufficient amounts cannot be obtained from the diet, supplementation may be necessary. See more about carotenoids for the eyes. Up Next: See the Natural Eye Care Guide to Sunglasses and learn more about Cataracts.